You don't have to be a foodie to know that bowls are taking over. And no, we don't mean the kitchenware. From food blogs to Instagram, the bowls-as-meals concept has officially become a part of our culinary vocabulary. But aside from bowls' delicious flavor, it's the aesthetic beauty that's given rise to their global popularity. In short, bowls were made for Instagram. Gorgeous, layered, and colorful, these satisfying meals are just as pretty as they are convenient, flexible, and family-friendly. They also tie in nicely with the meal-prep trend. 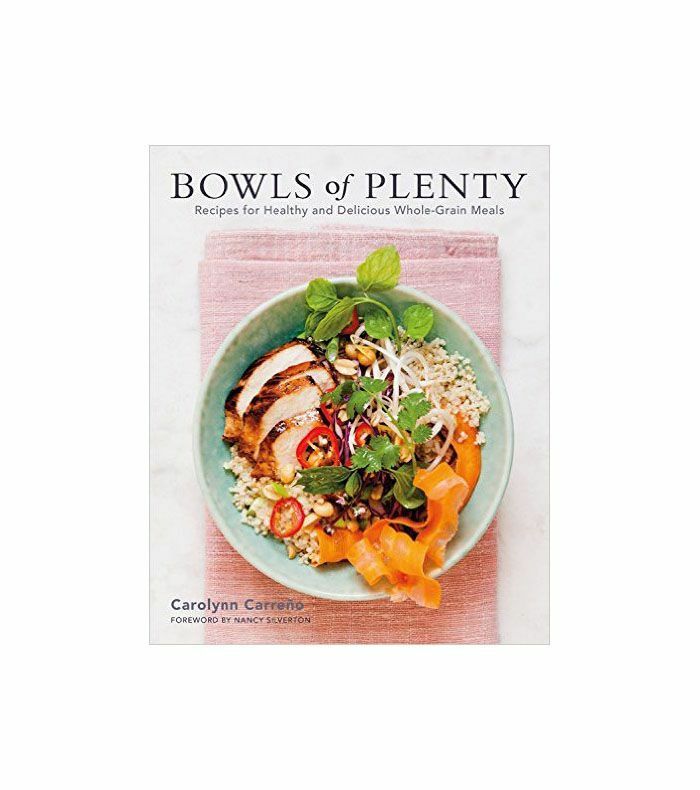 It's why Carolynn Carreño, the James Beard Award–winning food writer, decided to dedicate one of her 12 cookbooks, Bowls of Plenty, to the grain bowl craze with more than 100 recipes. "I think bowls are the new comfort food. Just like chicken and mashed potatoes struck a national chord in the hearts and mouths of Americans in the 1990s, I think there’s just something about digging food out of a bowl that is perfect for our time," she told MyDomaine. "I mean, a period in history when men and women wearing dirty jeans and holey sneakers can make millions and billions of dollars is obviously a time when we are going to want to approach any meal as if it were our morning cereal. Plus, bowls are the meeting place of healthy and delicious. It’s having our cake and eating it too, to which I say, yes, please." Ahead, Carreño shares the secret to layering the perfect grain bowl, along with the gadgets and her top-five favorite grains. Be sure to scroll to the end for three exclusive recipes from the book. MYDOMAINE: What are the kitchen gadgets we need to create bowls? CAROLYNN CARREÑO: Luckily for you, you really don’t need anything to make a grain bowl that you wouldn’t need to cook anything else in life. Okay, there’s one: a fine mesh strainer. You need this to rinse grains, especially small ones, like quinoa, without them falling through. And then there are bowls. You know how you have lots of plates, plates of different sizes, in your house? Well, since the bowl is the new plate, now you’re going to want bowls in different shapes and sizes. For main dish bowls, I suggest large, or large-ish, wide-mouth bowls. I love to serve and eat out of a bowl that is likely meant for plunking vegetable side dishes down on a family table. A bowl like this makes it easy to move food around in it without the food falling out. I think this is a good idea. Plus, I just gave you an excuse to go shopping for bowls. You’re welcome. MD: What is the secret to layering a bowl so it looks as good as it tastes? CC: Making a grain bowl is like going to a salad bar or to any buffet. Sure, you can just throw a bunch of random ingredients together, drizzle some sauce on top, and call it a day. But for a truly great grain bowl, you’ll want to exercise some self-control. And most importantly: pick a theme. If it’s summer and tomatoes and corn are delicious and everywhere, then make that your theme (mine is called the Chino Ranch Summer Vegetable Bowl for the farm where I buy those things). Dead of winter? Nothing but kale and collards to be found? How about a kale Caesar salad–themed bowl, or one that highlights collard greens shredded and quickly cooked in the Brazilian bowl? Or the market vegetable bowl, which is all root vegetables—the perfect bowl to hunker down with during the colder months. Another approach to creating a grain bowl above the rest is to think of dishes you like and turn that into a bowl. The burrito bowl is the iconic example of that. (In BOP, it’s is a build-your-own story in the Ultimate Burrito Bowl). MD: Grain bowls have exploded in popularity. What are the types of grains we can include other than rice? Quinoa has a great fluffy texture, a mild delicious flavor, and it cooks quickly. All that, and it’s also gluten free. Besides brown rice, it is hands-down my grain bowl go-to. Ten years ago, we didn’t know how to pronounce it, but quinoa is definitely here to stay. I often hear that this or that grain is "the next quinoa." The last one I heard was teff: "Teff is the new quinoa." It's not. Quinoa is the new quinoa. Millet, also gluten free, are the tiny yellow balls that you know of as birdseed. It can cook up mushy, which is why it works well as a high-protein, nutritious base for a polenta bowl. But if you cook it correctly, it doesn't have to be mushy. It's pretty, and it has a unique flavor and that fluffy texture that we love in well-cooked rice. Now that I think of it, millet could be the next quinoa. Wild rice is kind of forgotten in grain bowl world, maybe because it's nothing new to us. You often see wild rice sold in a mix with brown rice—I assume because wild rice is so expensive—but don't bother with that. If you're going to go for it, go for it. Live big. Wild rice won't be your most economical grain bowl base, but it has a wonderful chewy texture and an earthy flavor that is easy to love. It's one of my favorite go-to grains for making salads, and it's delicious with salmon, roasted vegetables, and (get this): peanut sauce. Don't overcook wild rice, or the grains explode and you lose their pretty, shiny black exterior and that lovely long, slim shape. Farro is an ancient Italian relative of barley. It has as a lot going for it: It's widely available, and it has great flavor and a nice chewy texture. But sad news for farro: It has gluten. Some argue that farro, because it is an unmodified crop, doesn't have the same negative effects that modern-day processed wheat does. I'm not a doctor, so I don't want to say. But what I will say is that farro makes a yummy chewy base for any grain bowl that isn't Asian or Mexican, it's delicious in grain salads (such as the Shaved Brussels Sprouts With Pecorino in BOP), and it's the perfect grain to throw into soup. Sorghum is a gluten-free grain that is perfectly round, white like pasta, chewy, high in protein, and I can't figure out why it isn't more popular. Maybe because it takes forever and a day to cook (or a little over an hour), but the time can be cut down if you soak the grains overnight before cooking them. Plus, cook it up in advance and refrigerate or freeze it for later. Sorghum has a mild flavor, so it goes with anything. Cook up a batch of sorghum, wild rice, and red rice or quinoa to make your own super-nutritious tricolored, gluten-free grain mix. It's also delicious thrown into a soup or tossed with vinaigrette to make a grain salad, such as the Sorghum Greek Salad. MD: What tips/advice do you have for busy people who want to make them ahead of time? Meal Prep: Organization and meal prep are the keys to eating well (by which I mean healthy and delicious) every day, and it's a perfect way to approach grain bowls. Cook grains and refrigerate or freeze them in individual portions. Use them to make grain bowls, toss them with veggies and vinaigrette for grain salads (adios, sad desk lunch! ), or heat them up with the milk of your choice and fresh or dried fruit and you have super-healthy, inexpensive porridge. In Bowls of Plenty, there are recipes for proteins that are great meal prep options, such as turkey picadillo (spiced ground meat), lamb meatballs, poached salmon, braised root vegetables, roasted vegetables, beans, hummus, and sauces, marinade, and vinaigrettes. The Vietnamese Bowl, the cover model of BOP, is 100% meal-prep-able. Make the quick marinade and shake up the vinaigrette in a jar. Shred some veggies. Cook some grains. Buy whatever protein you want. And you will be ready to prepare dinner in less than 15 minutes for the rest of the week. Marinate chicken breasts in advance (Chicken Caesar Bowl and Vietnamese Bowl), and grill them at dinner time, or grill and slice them to put on your take-to-work grain bowl lunch. Stock Your Kitchen: I know this might sound obvious, but stocking your kitchen with food you like to eat makes it easier to prepare last-minute meals. A bag of frozen shrimp in the freezer makes easy work of the Baja BBQ Shrimp Bowl. Nuts and seeds are your grain bowl and grain salad friend. Salted pumpkin seeds, sunflower seeds, cashews, peanuts, and almonds are those I use most. Fresh vegetables, of course. Buy what you like. Grain bowls are flexible (and so are the recipes in BOP). And I know this sounds weird, but I like to keep a head of cabbage (usually green but purple also does the trick). It lasts forever, and with that, you can add shredded cabbage to a Mexican-ish bowl, make a slaw such as the Sticky Rice and Apple Slaw, or sear it and dress it with a few drops of sesame oil like I do in the Sambal Tofu bowl. In my mind, you got cabbage, you got dinner. "I do not have the digestive system to be a food writer. All the multicourse dinners, the food events, the recipe testing, the tasting. I know, not exactly a sob story. Still—in the words of a long-lost friend from Rome—eating this way makes my liver hurt. This bowl is what I eat when my liver hurts: a big bowl of brown rice piled with broccoli. Adding ponzu sauce and maybe, maybe, an avocado is as decadent as I want to go. "The morning after eating this bowl, I wake up and I can hear the faint sound of my renewed organ whispering, 'Grazie, Carolina. Grazie!' Togarashi is a Japanese spice blend. You can use furikake (another Japanese seasoning, made of seaweed) or toasted sesame seeds instead. All of these can be found in the Asian section of upscale grocery stores, or in Asian grocery stores." Adjust the oven racks so none are near the oven floor; you will put the baking sheet on the oven floor. (If you have an oven that doesn’t allow you to put a baking sheet on the floor, put one rack as close to it as possible.) Preheat the oven to 500°F. Spoon the rice into four bowls. Put one avocado pitted side up on each bowl. Nestle the broccoli and lemon wedges next to the avocado halves and drizzle the ponzu into the hole left by the avocado pits and over the broccoli and sprinkle with the broccoli flowers, if using. The broccoli flowers are just for looks—and absolutely optional. Sprinkle togarashi over the bowls and serve the rest of the ponzu sauce on the side. "Ponzu sauce is a great 'bomb shelter condiment.' It takes about 2 minutes to make, out of ingredients you’re very likely to have on hand. This sauce, a boiled egg, and a bowl of steamed brown rice and I'm happy." "The one glorious year I had the good fortune to live in Venice Beach, California, I would walk into town on a fairly regular if not obsessive basis to pick up a quinoa and beet salad from GTA, the takeout store of the restaurant phenom Gjelina. When I moved from that neighborhood, I was forced to try to re-create the salad on my own, and this recipe is my re-creation. "Red beets stain anything they come into contact with. But in this salad, the red stain of the beet juice just makes the red quinoa and radicchio in this recipe more red, so the salad is fully committed to its redness. I sometimes use radicchio leaves as the 'bowls' to serve the salad in, but if that’s too cute for your taste, I totally understand. "In this method, the beets are wrapped in foil and then roasted in the oven, so it’s really a combo of roasting and steaming, which gives you the deep, concentrated flavor effect of roasting beets while keeping the beets moist and juicy." To prepare the beets: Adjust the oven racks so one is in the middle position, and preheat the oven to 400°F. Rip off a piece of heavy-duty aluminum foil (or doubled regular foil) big enough to enclose the beets. Put the beets on the foil and season with the olive oil, salt, and a few turns of pepper. Seal the beets in the foil and put the packet on a baking sheet. Roast the beets for about 1 hour 10 minutes, until they are tender when pierced with a toothpick or fork. Remove the beets from the oven and let the beets cool with the foil packets open. Peel the beets, wearing thin rubber gloves if you don’t want to stain your fingers, and cut into 1/2-inch cubes. Meanwhile, prepare the vinaigrette in a bowl large enough to toss the salad. Add the shredded radicchio and beets to the bowl with the vinaigrette and marinate for at least 10 minutes. Add the quinoa and hazelnuts, and stir to combine. Add the goat cheese in bite-size clumps and fold gently to distribute the cheese. "Thai curry paste is the best thing to happen to the hurried home cook since prewashed greens. All that mysterious and wonderful Thai curry flavor, distilled into a small affordable jar that you can find on the shelves of even the most unremarkable supermarkets. You need coconut milk and fish sauce to complete the magic, so if you keep those in your pantry, you’re just one fresh vegetable away from a warm and tasty last-minute meal. This is dairy free and vegan if you use water in place of chicken stock. If you wanted to add protein, add 1 boneless skinless chicken breast half, cut into 1/2-inch cubes, and cook it in the curry for 5 minutes before serving." Coat a large saucepan or straight-sided skillet with oil. Add the curry paste and cook over medium heat for 1 minute, stirring continuously, to release the flavors. Stir in the coconut milk, stock, lemongrass (if you’re using it), fish sauce, and sugar and bring the liquid to a simmer. Add the sweet potatoes and Brussels sprouts, reduce the heat to maintain a simmer, and cook for about 15 minutes until the potatoes and Brussels sprouts are tender. Add the bok choy and kale and simmer for 2 to 3 minutes more to wilt them. Turn off the heat, remove and discard the lemongrass, if you used it. Throw in the chilies, and basil, and serve the curry over the rice. What is your favorite bowl? Do you prefer sweet or savory?